It’s as if the unwashed underclass had descended en masse upon a posh London apartment, found the place empty, and commenced to frolicking about, exclaiming, “Now what shall we do?” Loudly congratulating themselves on their artful arrangements, they shrug off-stage, one at a time. The lights come on again. Eliza and Professor Higgins reclaim London, circa 1912. Just like the play’s purposefully unsubtle rearranging, the charm of My Fair Lady’s heroine is not in her delicacy. Cockney sparrow Eliza Doolittle, (Lauren Alburn) is discovered outside Covent Garden by phonetics professor Henry Higgins, played charmingly and convincingly by Alan Benson. Higgins meets Eliza, with her boisterous attitude and her wretched little dress. She implores, in earnest cockney, for passersby to “buy a flower off a poor girl.” A language purist and author of Higgins’ Universal Alphabet, Higgins is horrifiedÉand intrigued. He shocks her by correctly naming the neighborhood where she grew up—Lisson Grove—a guess purely based on her ghastly, ear-splitting dialect. Higgins makes a bet with Colonel Pickering (Stephen Espinosa): In six months’ time, he can transform Eliza from a draggle-tailed guttersnipe to a veritable duchess, just by teaching her to speak properly. What keeps Eliza in the gutters, Higgins believes, isn’t her bedraggled, patched outfit so much as her shameless butchering of God’s own language: English! Stephen Espinosa’s portrayal of the rational, level-headed “straight man” makes the comically embittered Higgins seem even more exaggerated. Espinosa’s talents, as he says himself, are more musical than theatrical. Yet Espinosa is convincing as the serious, cultured Pickering. As Higgins launches into one of the two sharp-witted “sexist diatribes” of the play, as actor Benson is wont to call them, Pickering is the one saying, “Do be reasonable, manÉ” Ultimately, however, he allows Higgins to have the last eloquent, inflated word on the matter. If Higgins’ views are so politically incorrect, why does no one seem offended by such musical musings as “Why Can’t a Woman (be more like a man)?” As director Rachel Hocket points out, we laugh because most of us know Higgins’ views are ridiculous to the point of absurdity. If we took him seriously, well, then we wouldn’t be laughing so hard. 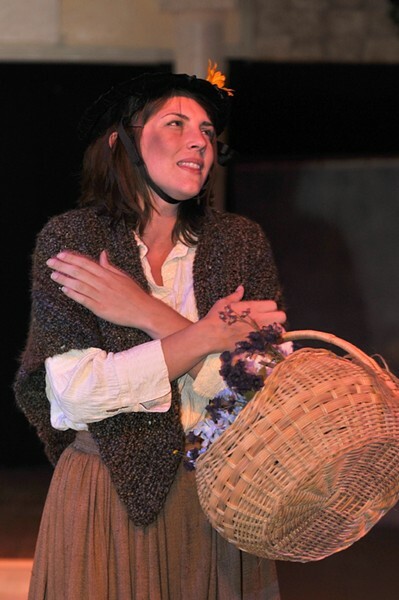 Lauren Alburn doesn’t let audiences down as Eliza Doolittle. Alburn’s Eliza is quick-tempered, yet lovable. During the song in which Eliza vents her frustrations against Higgins’ ceaseless orders (“Just You Wait”), her accent is perfect and her voice is exquisite (Audrey Hepburn’s voice, if you’ll recall, was dubbed over in the 1964 film). But during this scene, I couldn’t help thinking: Let it out, Eliza! Professor Higgins has just been so incredibly pompous and rude. Oughtn’t you to be livid? Eliza does appear pretty ticked off in this scene, but not enough to enact the revenge fantasies described in “Just You Wait.” Perhaps it’s just her lady-like lessons beginning to take effect. But I’m sure the fiery flower girl we met in Covent Garden wouldn’t have held anything back. Alburn is at her best in the Ascot race scene, when Eliza’s sincerity and exuberance liven up Ascot’s stuffy, prestigious old-money crowd. Pretending in earnest to be a lady, Eliza manages only to superimpose a royal-sounding accent over cockney slang. A smashing sight in fabulous feathered headgear, Alburn has a sort of innocent, winning offensiveness that can melt the coldest of hearts. Alfred Doolittle is very much the opposite of Professor Higgins, who describes Alfred, jokingly, as “one of the most original moralists in England.” Mesker’s cockney accent and delivery are spot-on. For the audience, his appearance on the stage generally signifies a rowdy good time. My Fair Lady will be at SLO Little Theatre until June 22. For tickets, drop by the box office at 888 Morro St. in downtown SLO, call (805) 786-2440 or order online at slolittletheatre.org. General admission is $22; students and seniors pay $19.